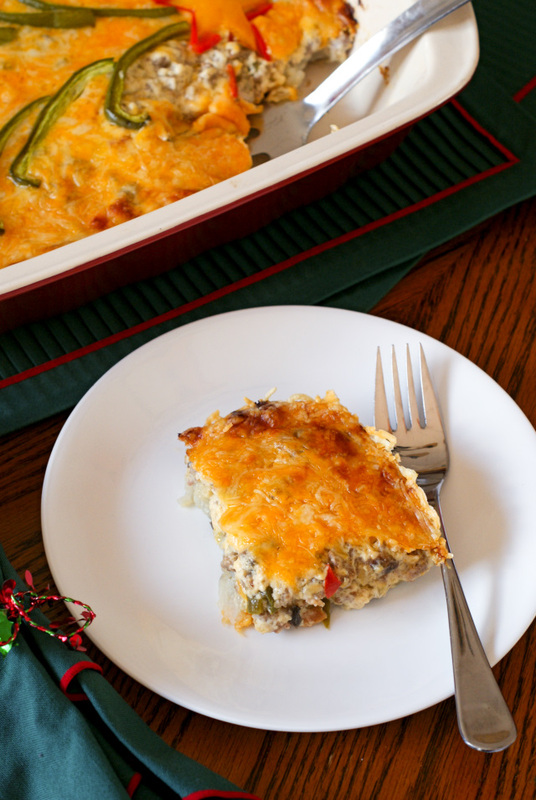 Holiday Hash Brown Casserole is a cheesy potato breakfast casserole that is loaded with fresh veggies and turkey sausage, making it truly holiday-worthy! I just love the month of December, don’t you? I genuinely look forward to the holiday season, complete with carols, twinkly lights, and the smell of a fresh cut Christmas tree. My husband and I both have three sisters each, which means we are blessed to be surrounded by lots of loved ones during our holiday celebrations. Big family gatherings are always accompanied by big family meals. When planning a meal that needs to serve lots of people, a potluck is a great way to go! When everyone brings a dish to share, it takes the stress off of whoever is hosting and makes the event a collaborative affair. Making a dish to share with the ones you love is a fun way to get in the holiday spirit of giving, and when you have a potluck, no one is left out of the fun! One of my favorite holiday meals to share with family is brunch. If you are hosting or attending a potluck brunch event this holiday season, offer to prepare a side and make this festive and delicious casserole. 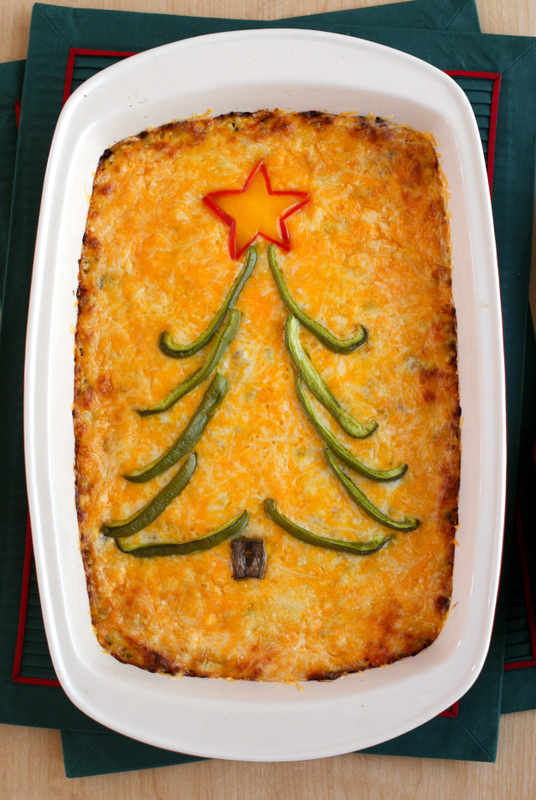 Made with hash brown potatoes, turkey sausage, fresh veggies, and lots of cheese, it is truly holiday-worthy! It will round out a brunch spread perfectly and fit right in with other favorites like quiche, cinnamon rolls, and crisp strips of bacon. 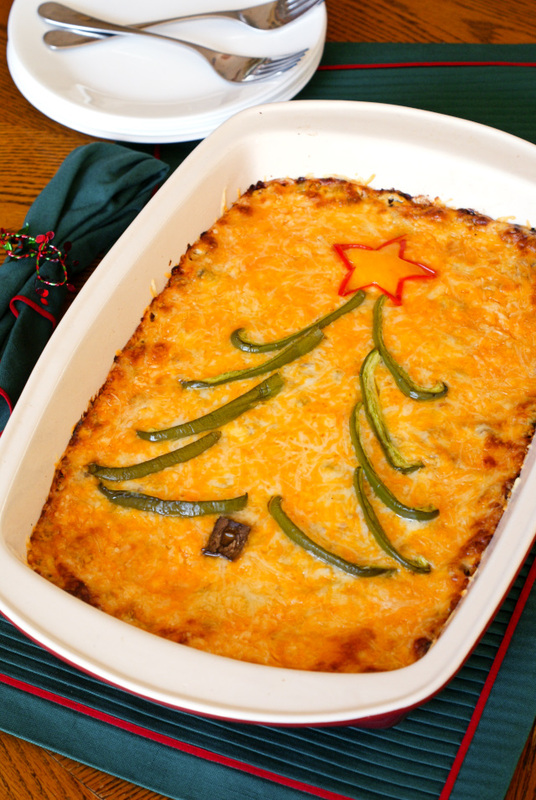 If you’re serving this casserole for Christmas, it’s fun to top it with some extra veggies in the shape of a Christmas tree! You can easily omit them for other holiday events and the casserole will be just as delicious. Either way, this loaded hash brown casserole with fill your belly and warm your heart as you enjoy it with your loved ones this December! Preheat oven to 350 degrees. Grease a 9 x 11 glass baking dish. Brown the turkey sausage in a large skillet over medium-high heat using your spatula to break into crumbles. Transfer the sausage to a large bowl. In the same skillet, heat 1 Tbsp of olive oil. Add the mushrooms, onions, and bell peppers to the skillet and cook for 4-5 minutes, or until vegetables are softened, stirring often. Add the frozen potatoes, vegetables, cream of chicken soup, Greek yogurt, salt, and pepper to the bowl with the sausage. Mix to combine. Spread the sausage mixture evenly over the hash brown potatoes and top with the shredded cheese. For a festive holiday presentation, add sliced bell peppers in the shape of a tree to the top of the casserole before baking.